I am in love with this line of fabric from HGTV !! I was lucky enough to be one of the first to review this fabric and I could not be more exited to share this fun tutorial with you. The best part is... It uses only one yard of fabric!! 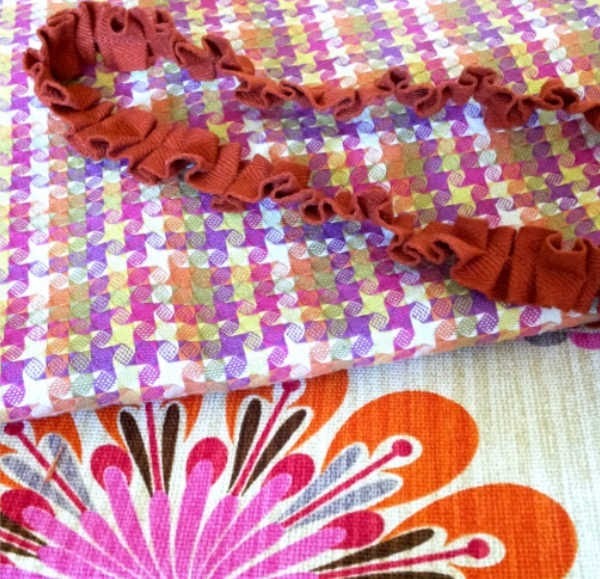 Right away I knew exactly what I wanted to make with this fun, brightly colored fabric. I found this tutorial for a floor cushion at Living with Punks. Note* If your fabric is not 54" you can piece together two pieces. Once all your pieces are cut, pin your piping along the edge of your circles, making sure you pin it to the right side of the fabric. Pin the ends of your piping at an angle. The ends should look similar to the photo below. 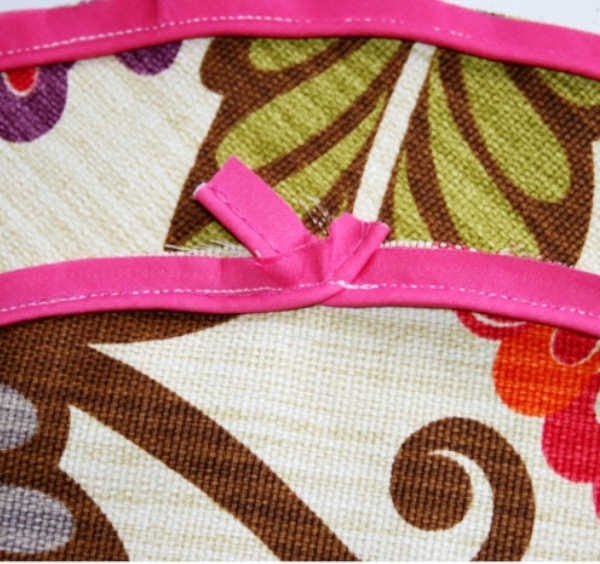 After you sew your piping around your circles, sew a length onto the sides of one of your handle pieces. Once the piping is sewn on you can pin you other handle piece on top (right sides together) then sew using your previous stitching as a guide. 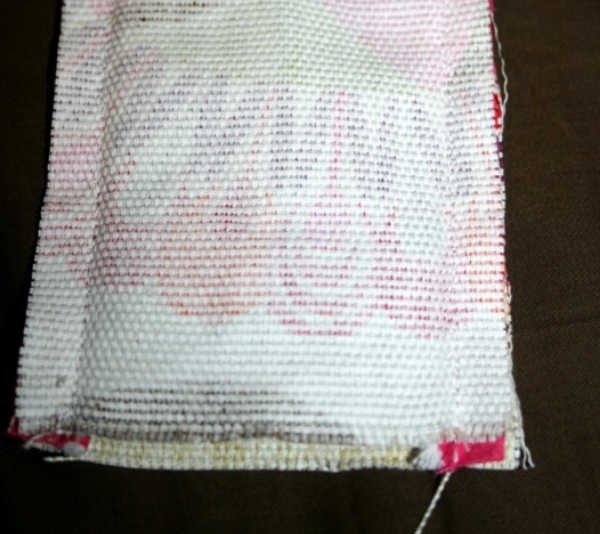 Turn your handle right side out, tuck in the edges, iron, and sew onto your side piece. 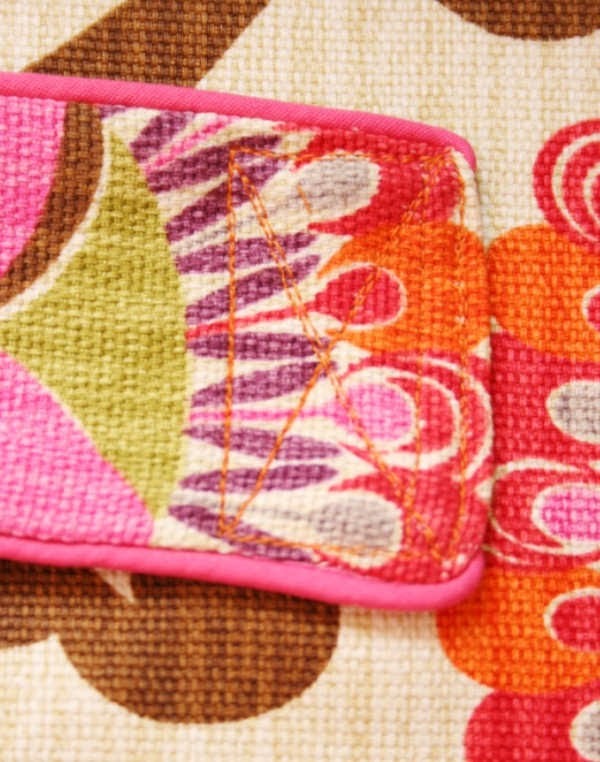 I wanted to make sure the handle would stay on so I double stitched a rectangle with an X in the middle as shown below. Now its time to sew your side onto your end circles. 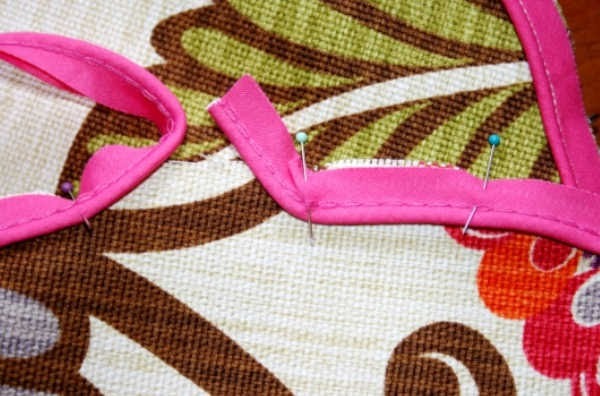 Pin around the entire length of the circle and then pin the ends of your side piece together. 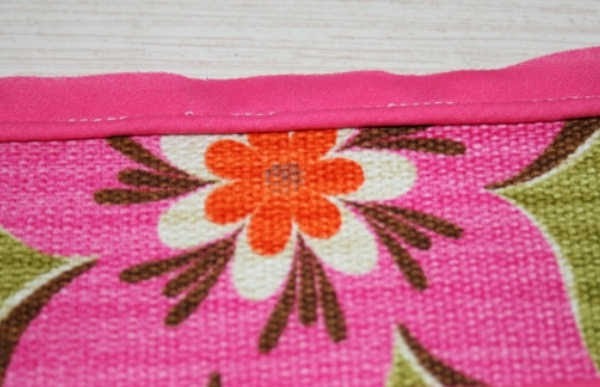 Sew your side seam first and trim off any extra length. 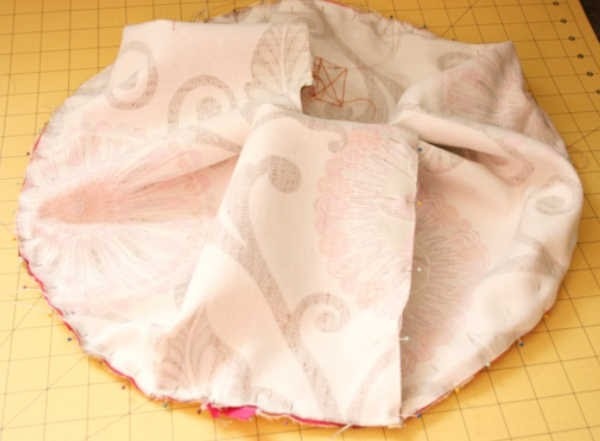 Then sew around the entire circle using your previous stitching as a guide. I double stitch mine for extra durability. Pin on your top circle (right sides together). 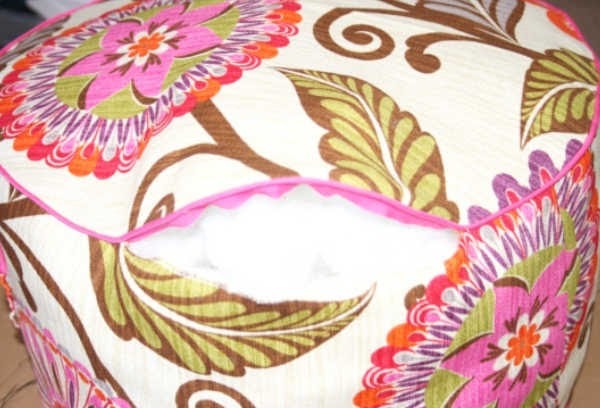 Sew around the length of the circle leaving a 6 inch gap. Turn inside out and fill with fiberfil. Now you can hand stitch it closed and your done! The girls love this floor cushion. The handle makes it so easy for them to drag it around. As for the fabric itself, it is beyond amazing. 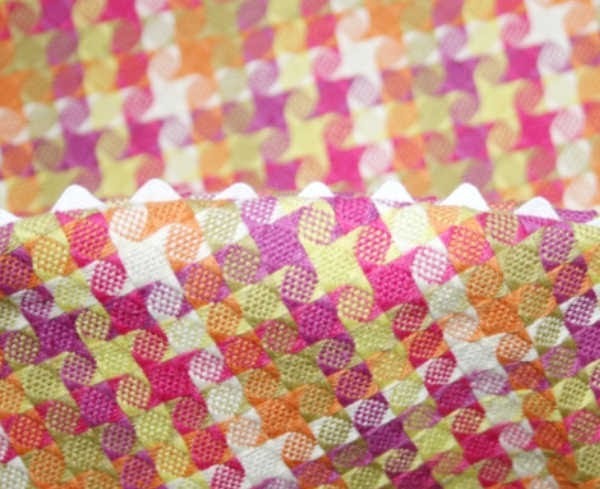 The thick upholstery fabric is thicker than normal quilting fabric. I would definitely recommend it if you are making anything for kids since it can stand up to a lot more wear and tear than many other fabrics. I also LOVE the colors. They are so bright and vibrant. If your wondering about the Checkered Past upholstery fabric, I started making a second floor cushion for my oldest but I decided to try out ric rac instead of piping and I didn't like it at all. So it will have to wait until I get some more piping. I have yet to do anything with the trim. Any ideas?? I would love to know what you would do with a yard of 1'' Pleat Twill Cognac? Need to get organized? Be sure to check out my Etsy page for tons of organizing printables. Thank you Marilyn. It was so simple to make and the girls love it. I've pinned this as my daughter just asked me to make cushions for her kids to watch tv. Thanks! I'm thinking that trim would look pretty cute on a lampshade. just found these and i am going to make up a few for my living room for the kids thanks for sharing. 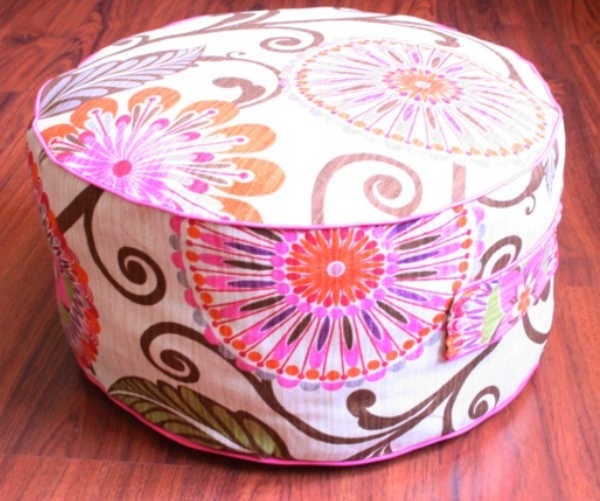 The Joann fabrics are matchless...your project was cute and those cushions are best. 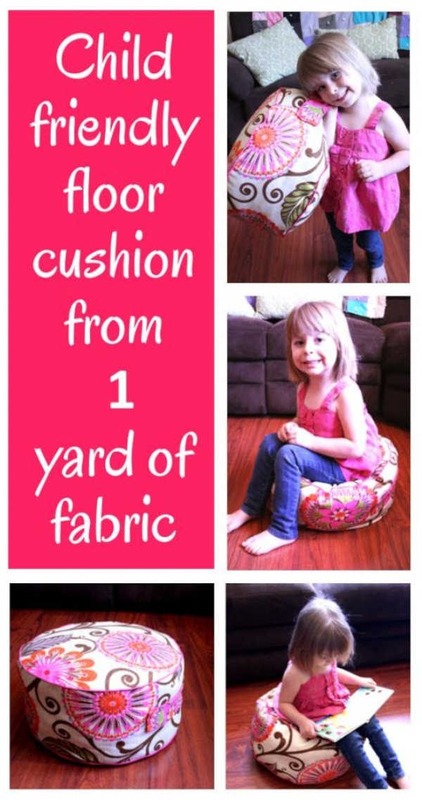 Thanks for the fantastic tutorial and tips to make home made floor cushions. Your floor cushions looks really comfortable. I will do this because the right floor seating can really be some of the best in the house. Thanks for the tutorial. I would love to make a couple of these for my two kids. The yard of 1" Pleat Twill Cognac would look great as an accent on some curtains, or even used to make a ruffly pillow or purse. I will definitely be making some of these for Christmas gifts this year!! Great tutorial and floor cuhsions are so popular at the moment, I guess largely because they can add so much flexibilty to a room. I'd use the ruffle in between the main part and the cuff of a pillowcase. I've done it--looks sweet. Cute! Going to have to make one for son so he stops taking the couch pillows and using them for seats! I just finished making this for my 1-year old granddaughter. It was so easy and turned out so adorable! Thank you for you clear instructions that made it so easy and fun!